Wesley-Willis United Church was formed in 1925 with the joining of the congregations of Wesley Methodist and Willis Presbyterian. The story of each church goes back almost seventy-five years before that. 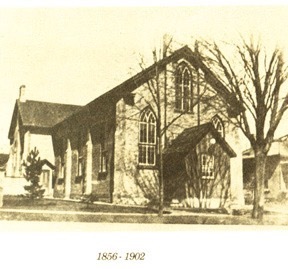 The first Presbyterian church, a frame building, was built in 1855 and was located on the present site of St. Joseph's Roman Catholic Church. This church was later abandoned and sold, and in 1884 a fine new white brick building was built on Rattenbury Street E. The contractor was Mr. Henry Stevens and the first preacher in the new church was Rev. E. A. McDonald. There was no organ in the church for many years "as many of the early Scotch folk did not believe in that type of music." A small hand organ was donated by "R. Irwin, who operated an elevator in the town's early days", and later a pipe organ was installed. One of the Willis Presbyterian Church's ministers was Dr. A. Stewart who served the congregation for a record thirty-four years. Unfortunately, many of Willis Presbyterian church records were lost in the fire which destroyed Wesley-Willis church in 1928. 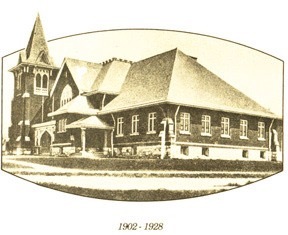 At the time of church union in 1925, when Willis Presbyterian united with Wesley Methodist, some of the members remained with the Presbyterian Church of Canada. Eventually the former 'Willis' church became their church once again and the name changed to St. Andrews Presbyterian. "Prior to 1854 the Methodist work was a part of the Goderich Wesleyan Methodist Mission. In that year Clinton became part of the Clinton Circuit which included Turners, Pearens, Kinburn, Londesboro, Rudds, Holmesville, and Tipperary. In 1856, a group of families in Clinton met to form their own Methodist congregation. Allen S. Fisher and Wm. Robinson were secretary and treasurer respectively of the trustees of this group. The Rattenbury St. Methodist Church was begun in 1857 on lot 234 Rattenbury St. W. and dedicated in January 1860. Rev. Thos. Leghorn was the first pastor and Robert Callendar, Clinton's first mayor had a young peoples' society and a choir going by 1877. The Women's Missionary Society was organized the following year and Thos. Stevenson, Clinton's first town clerk, initiated a Sunday School. By the turn of the century the Rattenbury church building was deteriorating and it was decided to build a new church. Property was purchased in 1900 at the present Victoria St./King St. location. The building committee was composed of Bros. Manning, Harland, Chant, Cooper, Hodgens, Doherty, Walles and Cantelon. Early in 1902, Wesley Methodist Church was dedicated. In June 1928, fire destroyed all of the building except some of the tower. Dr. Percival Hearn, recording steward at that time, wrote of the fire, "Our comfortable beautiful church was burned, leaving nothing but a blackened ruin." By 1918, union of the Methodist, Presbyterian and Congregationalist churches was being discussed across the country. After much discussion in Clinton, Wesley Methodist and Willis Presbyterian churches united in October 1925. The Wesley church was chosen as the place of worship, and Rev. J. E. Hogg, former minister of Willis congregation became the new pastor of the Wesley-Willis United Church. After the fire in 1928, services and meetings were held at Ontario Street United and other locations in town while a new building was built. The new church was built on the old foundation, of red brick to match the brick of the tower. On June 30, 1929 Rev. A. A. Holmes and Rev. J. E. Hogg dedicated the present church. The annual reports for the years since 1929, show Wesley-Willis as a church active in the community and deeply committed to the support of mission work. They list the activities of such groups as Women's Missionary Society, Women's Association, Evening Auxiliary, Girl's Club, Board of Stewards, Young People's Union, Canadian Girls in Training, Baby Band, Bob McClure Mission Band, Men's Club, Senior Choir, Junior Choir, Primary Choir, Church Band, Youth Group, Explorers, Venturers, Over Fifty Club, United Church Women, Morning Glories, Nightingales and on and on . . . . . . Through the years the church sheds were sold, Wesley-Willis and Holmesville amalgamated in 1953, a new manse was built, a new recreation/Sunday School room was built in the basement under the church sanctuary, in 1979 a new enlarged parking lot entrance and main floor kitchen and washroom were built, eight stained glass windows were donated and installed in 1980, the pipe organ was rebuilt, a recording of the three choirs was made in 1984, a new roof was put on over the sanctuary, the bricks were pointed and in 2005 a new membrane roof was installed over the Fellowship Hall. During recent renovations to the basement level, a reminder of the 1928 fire was revealed. The blackened timbers outlining the windows were uncovered bringing history back to life. Wesley-Willis is honoured to have had three members of our congregation answer the call to the ministry: Rev. Donald Cornish, Mr. Robert Parr and Mrs. Barbara Hicks. We are pleased and proud to call them our own! As of June 2006, Wesley-Willis (after becoming a single point charge without Holmesville) and Ontario Street United Churches became one with a new identity as Clinton United Church. With determination, dedication, faith and fellowship, the two United Churches of Clinton will continue as one vibrant congregation for many years to come.